That said, there are a couple of other articles here on Cheap and Sleazy -- Melody's article, Ann Record's " Get Outta CR School" article, and my (still unfinished) A Match Made in Heaven -- that also addresses various methods of practice, and at least one more in the planning stages which will -- well, should -- complement all of these quite nicely. Should you find yourself stuck in an indecision matrix over which method is best for you, look through each one, take notes, and do what Bruce Lee did when he created his own martial art, Jeet Kune Do: take a bit from everywhere. 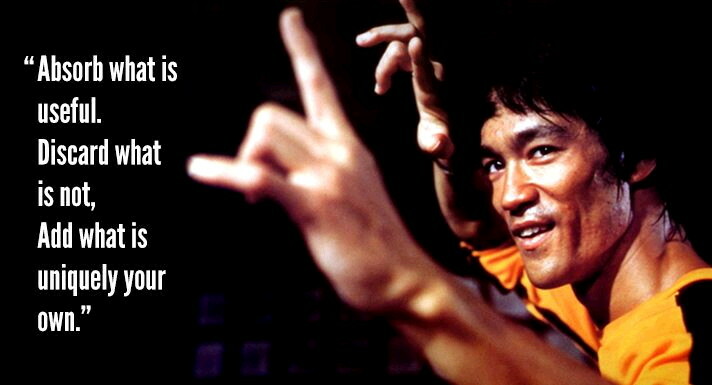 More specifically, what Bruce did was he studied all of the martial arts he could find, and incorporated bits of each of them into his own ever-growing art, which gave rise to his most famous quote: "Absorb What is Useful." Yeah, that definitely applies to steno! Enjoy -- and good luck!